Rescuers off California on Tuesday freed a badly tangled humpback whale caught by fishing anchors that were dragging it to the ocean floor. A rescue team that included members of the state's whale-entanglement teams, fishermen, academics, marine veterinarians and the U.S. Coast Guard unsnagged the whale Tuesday, after nearly eight hours of cutting off fishing lines, buoys and anchor lines wrapped around the animal, team leader Pieter Folkens said by phone, from near the rescue site. 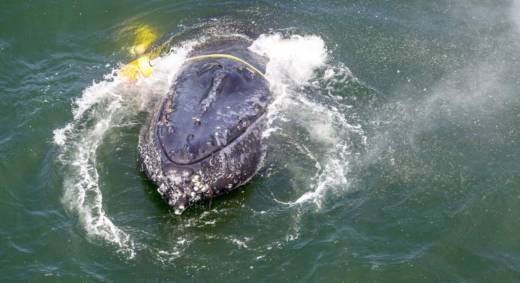 Once freed, the whale circled the rescuers' boat before swimming away.